In his recent European election campaign, Alexis Tsipras indicated that one of the key-points of his programme was the necessity to fight “against the idea of a Fortress Europe”, and to conceive an “inclusive form of community”. The idea of Europe as a “fortress”, as a closed, self-defending universe, has a long and quite bizarre history. The phrase “Fortress Europe” was probably used for the first time during WWII, as a propaganda term. Curiously both sides of the conflict took recourse in the idea, but gave to it opposite meanings. In the British context, “Fortress Europe” was a battle honour accorded the Royal Air Force, to describe operations against Nazi-occupied zones in the continent. From this external perspective, the fortress was the target of a military action: something already firmly established, that it was necessary to destroy. On the other hand for Nazi propagandists “Festung Europa” referred to Hitler’s project of fortifying the whole of occupied Europe, as a response to the failure of the German campaign in Russia and to the resulting threat of a double invasion of the Reich, both from the East and from the West. In that case, the fortress was something to be constructed through a system of defences that harked back to the set of fortifications built in the eighteenth century by Frederick the Great. 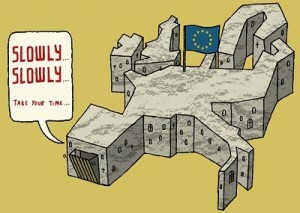 The ambiguity of the phrase “Fortress Europe” is still with us. The idea of Europe as a “Festung”, for example, recently became a slogan of the far right Freedom Party of Austria, still flourishing after the end of the Haider era as the astonishing result in the recent European elections (20,5%) clearly confirms. The idea of fortress here has a positive sense; in the face of increasing migratory pressures from extra-European countries, Europe must indeed become a fortress! Because this “Festung” (unfortunately) does not yet exist, it is right and proper to build it by means of the abolition of the Schengen agreement and the re-installation of the old state national borders. In a totally different sense, “Fortress Europe” is also the name of a well-known internet blog, translated in twenty-one languages, that serves as an observatory of the phenomenon of immigration, told through the story of its victims: people who strove to enter the fortress, giving their lives in the attempt. This tragic phenomenon raises a big question that involves politics as well as philosophy. While within European countries it is more and more difficult to share a common idea of Europe, with the consequent risk of building protective walls around a substantial emptiness, a vacuum deprived of any positive trait, it seems at the same time that the only strong idea of Europe might come from its outside, on the initiative of people who are ready to place their own existence in jeopardy, just to access a universe that makes every effort to keep them out. Any study concerning immigration should probably take account of this paradox. In light of this framework, what becomes clear is the ambiguity and the inadequacy of the term “fortress”, when applied to Europe. What we mean by Europe is something more complex that cannot be conceived either as a fully enclosed realm or as a wide-open space. Contemporary philosophy has often tried to handle this complexity. Jean-Luc Nancy, referring to this problem, stated that Europe is essentially “a landscape of countries”, whose multifarious representations constitute its authentic fundament. Italian philosopher and politician Massimo Cacciari, in a close confrontation with Nancy and Lacoue-Labarthe, referred to Europe not as a continent, but as an archipelago, i.e. as something which is necessarily plural, finding its authentic unity precisely in this condition of plurality. In a recent interview Cacciari returned to this topic, originally discussed in the nineties, showing how the present phenomenon of anti-European movements can actually be understood as a consequence of the incapacity of European politics to conceive this archipelago. All these anti-European movements follow a logic of pure identity, thinking of Europe as a centralized idea and isolating themselves from the “play of distinction”, that regulates the relations between the multifarious European contexts. The only possible answer to this trend would consist in giving up all the debates about European identity and unity and highlighting precisely the differences that make Europe what it is: a complex creature whose essence corresponds to its same inner heterogeneity. The difficulty to define, even geographically, the very idea of Europe reveals the fundamental permeability of this region, its essentially dynamic character. The big challenge consists here in determining which kind of political form would be capable of organizing this space, given its complexity. Following Tsipras’s example, it must be asked whether the task of building an “inclusive community” can be seen as a valid alternative to the idea of fortress. Defining a community as ‘inclusive’ can actually sound quite pleonastic. How could a community ever be ‘exclusive’, rigidly closed on itself, rejecting others? The same idea of ‘common’, as a space of ‘being-with’, according to the definition given to it by Nancy in The Inoperative Community, implies this character of inclusiveness. On the other hand, as another European philosopher, Jan Patočka, noticed already in the fifties, the European political project, as it was pursued until the twentieth century, can be interpreted as an effort to make the “comm-unity” (i.e. an ensemble of alterities who spontaneously decide to coexist) a “unity”: “ut omnes unum sind”, “that they may all be one” (Gospel of John, 17:21). 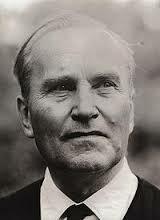 The effort to solve in a purely rational way any kind of political conflict, establishing a perfect homogeneity within society, is at the base of what Patočka called “supercivilization”, meaning a particular political conformation, originating in modern European history, in which every element of difference is excluded from society or even brutally erased by political power, in order to preserve its univocal structure. The consequence of the elimination of any element of alterity corresponds to a sort of “addiction to things”; being incapable of taking a distance from the mere reality in which one lives, the individual seems totally lost in the mechanism he wants to rule, in its “quantifiable meaninglessness”. This same phenomenon was noticed already in the forties by another philosopher, María Zabrano, who dealt with an “atrocious enchaining to mere facts”, in order to describe the agony of Europe in the twentieth century. This same phenomenon has however a counterpart also in our present situation, as Darian Meacham correctly underlined, dealing with the risk of a reduction of politics to economic management. But Europe is also something more than this atrocious condition; its unavailability to be unanimously defined, its complex character, allows Europe and the subject who inhabits it to take its distance from this flattened structure, even in the harshest situation. “The genius of Europe — says Zambrano — is its capacity to detach itself from reality”. The “agony of Europe” consists in the struggle of the individual to maintain the last hint of this detachment, that the present condition continuously jeopardizes. In one of his last theoretical efforts, Patočka coined the idea of a “post-Europe”, with the aim of outlining this kind of detached perspective on Europe, able to preserve its spiritual traits, even in a situation of political crisis. As he clarified in a well-known study on this subject, the European philosophical and political project — exemplified by the idea of “ut omnes unum sind” — has already come to an end. Nonetheless, the acknowledgment of the failure of this project does not entail a simple overcoming of Europe. On the contrary, the subject who takes on this post-European perspective must be capable of looking back to European history, recognizing the “essential relationship” that bonds the present to the past. The only way to measure the depth of the abyss which divides Europe from its “post“, consists in the desperate attempt to fill it, trying to comprehend Europe’s complex meaning, envisioning its history. This is what Patočka has in mind, when he deals with the necessity to realize a “historical insight” into Europe. According to Patočka, this kind of insight has nothing to do with a positive knowledge of ideas. It is rather an “[…] insight into the fundamental moral relationships between progress and decline, between the possibility of freedom and its undermining”. The only way to contrast the “addiction to things” that characterizes the late season of Europe, consists in detaching from mere facts, which can be technically measured and ruled, and addressing the ethical position of the individual in the face of events that shatter her existence. Patočka determines in these pages an explicit analogy between “historical insight” and “moral insight”. Concretely, putting into practice an historical insight entails looking back and gathering at a higher level of reflection all the elements that characterize human history and identifying their ethical implications. What does this particular moral and historical vision entail for the life of the individual who engenders it? According to Patočka this perspective is anything but peaceful; it requires openly questioning what a good life is; not a mere existence, whose only task would consist in satisfying immediate needs, but rather a life in which the subject decides “[…] to bravely behave against the general misery, to struggle-in-the-trenches”, aiming to invert the “force of gravity” that affects collectivity and determines its flatness. This idea of “courage”, of brave struggle, often recurs in these pages: “The fundamental precondition of the ‘being-good’ is the courage, the possibility and the will to brave a danger, which is essentially a danger of life”. This courageous behaviour, however, also hides a risk, if the subject who undertakes it does not have a clear acknowledgement of the gravity of his situation. The post-European individual, who is willing to engage in this brave struggle, is not comparable to the figure of a titanic hero who, because of the exceptional nature of his actions, can simply detach himself from worldly experience. The danger consists on the contrary in the capacity of this individual to take a distance from reality, in virtue of the “post-“ that characterizes his position, but always maintaining his fundamental insight into the world, that does not allow him to easily abandon it. In other words, in order to fulfil this difficult existential position, the individual is called upon to ceaselessly jump the borders of fortress Europe, living on a threshold, deconstructing any trivial division. The nature of this “insight” is hard to seize. Only a gifted person, particularly subtle and persevering, will be able to realize this hazardous venture, which consists in envisioning the world and its history, without being simply reduced to its mechanism, but escaping its “quantifiable meaninglessness”, raising a retrospective fold that shatters the homogeneity of European tradition. Patočka tried on many occasions to give a further explanation of this particular form of praxis. In a seminar he held in 1975he used the phrase “spiritual man”, which also recurs in the essay on Post-Europe. In both these texts Patočka particularly underlined the character of active exposition of this subject, in view of the birth of a “new common”, of a new form of community founded by spiritual men on the Platonic principle of the “care for the soul”, whose political impact has been carefully clarified here by Daniel Leufer. This link between the ethical position of the subject and the political outcome of his action requires special attention. The question could be raised in these terms: is it possible to see this spiritual man as a politician? Patočka gives a clear answer on this point: “Clearly the spiritual man is not a politician, in the common sense of the word: he does not take part in the controversies that rule the world. He is however clearly political in another way, of course, and he cannot avoid being so, because he throws the non-evidence of reality against the face of society and of what surrounds him”. Once again, the emphasis is put in the capacity of this individual to shake reality, exploring it beyond the surface of pure evidence, unearthing its most problematic parts. Facing this background, not shrinking from its complexity, should become the task of a new kind of political subject. What kind of impact can this brave exposition have, if we conceive it not only as an individual perspective, but as the fundament of a renewed community? Roughly speaking, a community built on this base should be a community ready to give up the same idea of identity, conceived as a closed and impermeable unity, unable to face the conflicts that characterize any intersubjective space. As expressed by Anya Topolski in a recent article, also with reference to what Etienne Balibar and Roberto Esposito stated about this problem, we should start understanding Europe not as an idea but rather as a clash of ideas; as a community whose ground is not an exclusionary identity, but rather a comprehensive solidarity. This kind of new community should be capable of envisioning the otherness to which it essentially opens, without any intention to reduce it to any sort of unity; it would be essentially influenced by an “active tension”. As Patočka clarifies in his essay about post-Europe our soul is influenced by its thumos, which according to Plato corresponds to its median part, “the space of the conflict in ourselves”, the component that aggressively defends our same authenticity, not closing ourselves up, but, on the contrary, engaging us in a dangerous and courageous movement towards the other, through an overcoming of our single and limited existence. As Patočka points out, applying the idea of thumos to a communitarian space involves a harsh contradiction. How could something be, at the same time, an element of safeguard and an element of division? An element of defence and an element of conflict? The essence of this new community, according to Patočka, consists in maintaining both these two elements, facing the contradiction they entail. Adopting this new perspective would mean casting new light on the most problematic phenomena of the present European condition — immigration, movements of protest and dissidence, reviving nationalisms, anti-politics — with the intention to find new interpretative tools that could allow us to handle these questions not despite, but because of their complexity. J.-L.Nancy, The Inoperative Community (Minneapolis and Oxford: University of Minnesota Press). “Thereby, though they [humans] also gave up their own selves, their distinctive place among all that is, which consists in being the living beings we know who relate to their being, who really are this relation. Being ceased to be a problem once all that is was laid out before us as obvious in its quantifiable meaninglessness”, J. Patočka, Heretical Essays, 116. M.Zambrano, La Agonia de Europa ( Buenos Aires: Sudamericana 1945). Jan Patočka, Europa und Nach-Europa, in Ketzerische Essais zur Philosophie der Geschichte und ergänzende Schriften, eds. K. Nellen a J. Nemec (Stuttgart: Klett-Cotta,1988), p. 207-287. “ Die Grundvoraussetzung des ‘Gutsein’ ist der Mut, die Möglichkeit und der Wille. Der Gefahr zu trotzen, welche im Wesen Lebensgefahr ist”. Ibidem: 27. Jan Patočka, “Duchovní člověk a intelektuál”( The Spiritual Man and the Intellectual), SS-3/PD-III, (Complete Works 3 – Care of the Soul III), p.366. Dr Francesco Tava is a post-doctoral research fellow at the Università degli Studi di Milan and the Jan Patocka archives in Prague. This entry was posted in Europe, Euroscepticism and tagged community, European identity, fortress Europe, heterogeneity, immigration, Nancy, Patočka, Solidarity, Tsipras. Bookmark the permalink.